A person in armor will not look complete without the proper wrist protection. As a matter of fact, we would go so far as to say a good pair of shiny bracers could make or break a costume. Especially if you're a gladiator, or a Greek or Roman soldier. What about a Spartan? You don't see them wandering around with unguarded forearms, do you? That'd be scandalous! 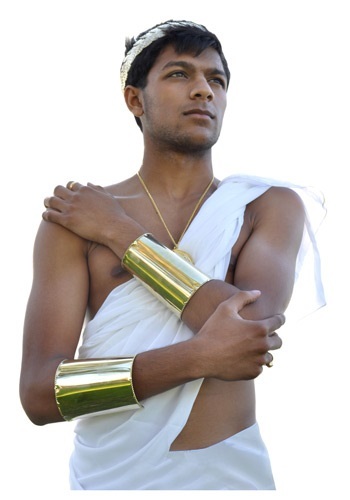 So if you're looking for the missing touch to your ancient armaments, look no further than our Gold Roman Cuffs. The cuffs are about 5" long, adjustable, and are gold in color. Perfect to go with Caesarean armor, Egyptian bangles, or even for a Greek gods and goddesses. Remember. Every wrist needs the proper bling.